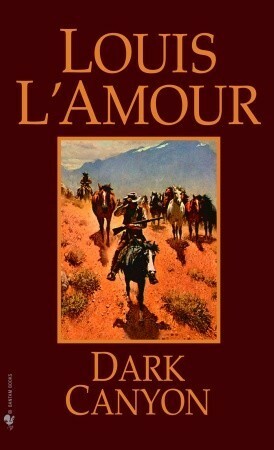 Dark Canyon by Louis L'Amour is available at Amazon, Barnes and Noble, and BooksAMillion. This book isn't part of The Sacketts series but we do catch a glimpse of Tell Sackett when Riley moves cattle down the outlaw trail. When Gaylord Riley walked away from the Coburn gang, he had money and a dream. He worked hard and built a cabin, gathered a herd of cattle, and fell in love with Marie Shattuck. But when he is confronted with false accusations of rustling and murder, Riley is forced to defend his new law-abiding way of life. Outnumbered and facing a lynching party, Riley is surprised when his old friends return to lend him a hand. But how can they help him and keep themselves out of jail? With the local marshal already suspicious of Riley, the Coburn gang will have to plan well and move fast. But that shouldn’t be a problem. Their reputation was built by doing just that. This is another one of L'Amour's books that doesn't feel complete to me because L'Amour took the easy way out, relying on a wishy-washy romanticism of the west and suspended disbelief to move events along. I wish L'Amour had taken time to build history around the story to remove some of the fantasy elements. I don't understand how or why this kid, Gaylord Riley, feels so much loyalty to the Coburn gang. He hooks up with them, plays lookout for a couple hold-ups, and, somehow, the gang morphs into friends close enough to be family who want to help Riley to stop being an outlaw and settle down before the law catches up to him. Then, Gaylord needs to move cattle through outlaw territory and all the outlaws comply without giving him trouble. They pitch in and help, you know, because outlaws are known for being nice and community-minded (snicker). The bad guys don't feel like bad guys until the latter half of the book and the bulk of the story plays out like a small-town soap opera set in the west, which isn't what I expect from an action-adventure book. The "feel" of this book reminds me of old Hollywood westerns and old movies slanted toward Disney-style storytelling (but, sometimes, I want a nostalgic read like that so I could feel differently toward this book on a different day, in a different mood). This book, like a few other of L'Amour's books, reminds me of a screenplay and I've wondered if the initial draft emerged as a script and changed gears at a later time in the editing process. The bones of a good story are here but it needed more construction.